The Autumn Accents Bigz Die from Stampin’ Up! is one of my favorite Big Shot die cuts. There is a coordinating stamp set called Wonderfall, which adds to the versatility of this stamping tool! What a simple card this is to make when your Big Shot does all of the work! It’s funny how much brighter that gold brad looks in the picture than it does in person! I’m wishing that I’d used the darker glimmer brad instead of the gold. I’m not a huge gold fan. Unless it’s attached to a giant precious gem, I really don’t love it! I’m also wishing that I had straightened out those candy dots! As imperfect as the card is when I look at it, I love this card layout! This is a super easy card! Even with measuring and cutting, you can make this in less than 10 minutes! 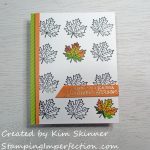 Perhaps instead of using the Autumn Accents Bigz Die to cut out a maple leaf from champagne glimmer paper, you could actually stamp the maple leaf from the Wonderfall stamp set or from the Magnificent Maple stamp in the Holiday Catalog. How pretty is the Sweater Weather Designer Paper? I haven’t found a single pattern that I don’t love. I will be sharing a card in my newsletter this week that uses another pattern from the set. I’ve used it several times already. I’m always surprised by how far a package of designer paper actually goes. You get 12 pieces of 2 sided 12 x 12″ papers. I love how they all coordinate with each other, so you can use more than one pattern on your project. I also fell in love with the Witches’ Brew Designer Paper. I made a two page scrapbook layout for my Simply Scrapbooking subscribers using this paper to create a Halloween layout and I really loved it. It was very hard not to show it off to everyone, but it is exclusive for my Simply Scrapbooking subscribers! 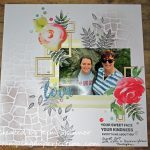 They get a two page scrapbook layout video tutorial and a two minute quick tip sent to their email every 15 days or so for only $4.95 a month. I’m really excited about the pages that I’ve been creating for the Simply Scrapbooking online series! My card today was created from this week’s Paper Craft Crew Sketch. You can see I followed the sketch pretty closely. I left out the corner detail, but otherwise used the sketch the way the layout was designed. It’s a great sketch! Create your own Autumn Accents card! 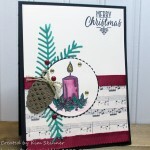 Thanks so much, Kim, for sharing your creativity in card making! I look forward to using this sample soon to make my own Fall cards!